I’m usually drawn to savory breakfasts, but this morning I was really craving something sweet. 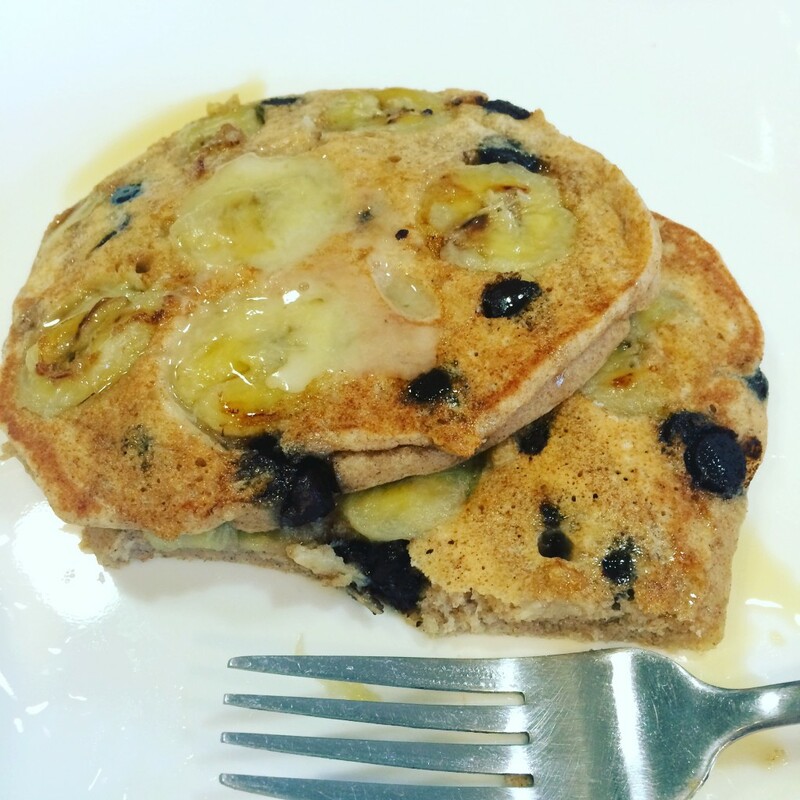 I found a recipe for whole-wheat pancakes, but I changed it a bit by substituting coconut oil for butter and adding cinnamon, vanilla extract, and, for extra fun, sliced banana and chocolate chips. Yum! Combine the milk and vinegar or lemon juice in a measuring cup. Set aside. In a large bowl, whisk together the flour, sugar, cinnamon, baking powder, baking soda, and salt. Set aside. In a separate bowl, whisk together the milk, egg, vanilla extract, and melted coconut oil. Pour the wet mixture into the dry, and stir until combined and smooth. Ladle the batter into the hot skillet. Place a few banana slices and a sprinkle of chocolate chips onto each circle of batter. When bubbles start to form around the edges, carefully flip with a spatula and cook for another minute or so, until golden brown. *Milk combined with vinegar or lemon juice is a substitute for buttermilk. If you have actual buttermilk, you can use that instead.